What is the COLUMN Function in Excel? 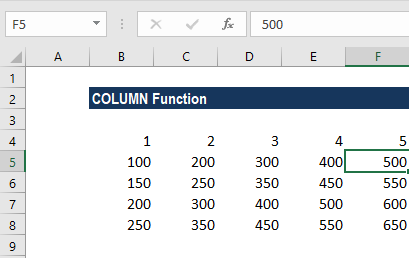 The COLUMN function in Excel is a Lookup/Reference function. This function is useful for looking up and providing the column number of a given cell reference. For example, the formula =COLUMN(A10) returns 1, because column A is the first column. The COLUMN function uses only one argument, that is reference, which is an optional argument. It is the cell or a range of cells for which we want the column number. The function will give us a numerical value. Reference can be a single cell address or a range of cells. If not provided by us, then it will default to the cell in which the column function exists. How to use the COLUMN Function in Excel? When we used the reference B6, it returned the result of 3 as the column reference was B. As you can see above, when we provide an array, the formula returned a result of 2. Using it with other Excel functions. Suppose a flower expense that is payable every third month. So, the flower expense is $100 and if we wish to generate a fixed value every third month, we can use a formula based on the MOD function. The formula can also be used for a fixed expense every regular time interval, a fixed payment let say every 6 months such as premiums, etc. 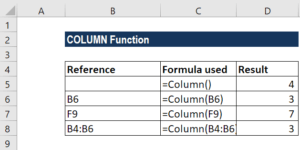 Here, two formulas are used: MOD and COLUMN. MOD is the main function used. The function is useful for formulas that are required to do a specified act every nth time. Here, in our example, the number was created with the COLUMN function, which returned the column number of cell B8, the number 2, minus 1, which is supplied as an “offset.” Why did we use an offset? It is because we wanted to make sure that Excel starts counting at 1, regardless of the actual column number. 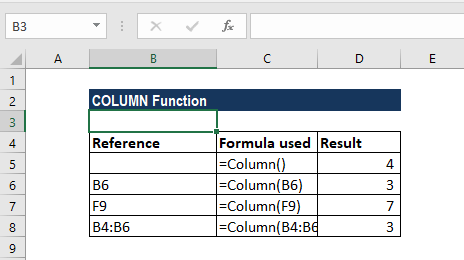 As we wish to sum every nth column, we used a formula combing three Excel functions: SUMPRODUCT, MOD, and COLUMN. Let us see how the COLUMN Function in Excel works. Where 1s now indicate “nth values.” It goes into SUMPRODUCT as array1, along with B5:F5 as array2. Now SUMPRODUCT multiplies and then adds the products of the arrays. So, the only values that last multiplication are those where array1 contains 1. In this way, we can think of the logic of array1 “filtering” the values in array2.